In the recent past, AOL has hit the headlines for all the wrong reasons â€“ for the mass exodus of its employees and the bad turn of events at the top technology blog TechCrunch.com which it acquired last year. But the company is still pushing on with its Patch initiative, a network of websites with hyper-local news. In India, however, it has taken a different approach and focused solely on the education sector. AOL India has recently announced the formal launch of Coolage.in, an online college magazine that is witnessing significant traction, especially on its mobile site. Techcircle.in caught up with Parthasarathy Madhukar, Director of AOL India, to learn more about the concept behind the website, growth and expectations, its USP, monetisation model using SMS alerts and the upcoming apps. Here are the excerpts. Coolage.in was launched earlier this year. Is this a re-launch? The pilot was launched in March 2011. We tested the concept with a select group of colleges in Bangalore and another institute outside the city. The new site went live on September 5, but we didn't announce it. Our strategy was to do more groundwork and reach a significant milestone. Now that we have reached 200 colleges and a new website, we are saying it has been launched. Tell us about the website's genesis. The seeds of Coolage were sown in the USA with AOL's Patch. And the bottom line is getting hyper-local content online â€“ it is part of AOL's global strategy. As Patch universities would be coming up in America next year, we wanted to see if Patch could be launched in India as well. It began as a research project where we were analysing consumer behaviour among the youth. We surveyed mobile consumer behaviour and trends during VAS (value-added services) usage across 18 cities and asked young people aged between 18 and 25 about VAS consumption. And we learnt that there was a huge download fatigue among consumers. Yes, there was an abundance of cricket, astrology and Bollywood VAS, but little else in other categories. We also learnt that there was hardly any coverage of extra-curricular events held at Indian colleges. An overwhelming number of students said that a lot happened at their campuses but those events didn't get any media attention. Even elite institutions like IITs or IIMs didn't get extensive Press coverage. So we decided to celebrate non-academic college achievements via Coolage.in. So what's the concept behind Coolage? Coolage celebrates college life. We shine the spotlight on the immensely talented and unsung heroes in the fields of debate, art, theatre and sports. In 2010, there were 43 million college-going students who did not have a platform to discuss what's going on in their colleges â€“ be it fests, debates or plays. Our platform allows college-goers to publish what's going on, in their own words. How many students currently write for the site? There are 260 student-reporters from different parts of India who contribute news and updates on a daily basis. And our editors train them. We also create job opportunities by offering them paid internships. Also, we have a partnership with AIESEC, a global student body that interacts with companies to bag international internships. We have worked with the organisation for annual activities. Why is it called Coolage.in? Actually, students suggested that name. It's another era â€“ after the Stone Age, Ice Age, there's Cool Age. It's all about hanging out with friends and burning the midnight oil to do what you like. How is Coolage different from other education sites in India? Well, everyone is gunning for test preparation in the online education space. But we don't tell students how to crack a GMAT or J-IIT or a medical entrance exam. We are not a blog site or a social networking platform. Actually, we are similar to a college magazine but we are in the online space. What we offer is editorial space. We get campus updates from students and do the site maintenance and housekeeping for them. We will also be the marketing force behind it. Already IITs and IIMs have their own pages on Coolage.in, with editors from those colleges. We train them in blogging and uploading content by using Blogsmith, AOL's content management system (CMS). Every hour, there is something live on Coolage. What's more, none has explored this niche yet and we have no competition. What's the traction you have seen so far on Coolage? We have 200 colleges on board and are close to touching a million page views. I can't share the exact number of users but it is in the range of hundreds of thousands. Student communities from all over India have shown a lot of interest â€“ we even have colleges from small towns like Erode and Wagah Border. Also, the site has grown by 30 per cent since its launch and the mobile site by 50 per cent in the past three months. AOL offers sponsorships and grants for college events and this has grown five times since the pilot. This is a great way for colleges to reach out to us. And we want to show them that we are not only putting our body, mind and soul into Coolage, but we are also an effective marketing force. During the past 6-7 months, we have spent a significant amount on sponsorships and we plan to increase it further. We are currently in the middle of a huge sponsorship deal. We had just two sponsorship deals in the pilot stage and now have a string of them â€“ for St. Johns, IIT-Kharagpur, St. Andrews, etc. What are the cool features of Coolage? We have photo galleries featuring various college fests. If you have a 3G connection on your mobile, you can also watch videos. The Collegium Vitae section is a list of colleges with campus profiles and other basic information. The Marquee section is entirely on entertainment while Tech-tonic is all about latest gadgets, apps and news from the technology world, written by students. 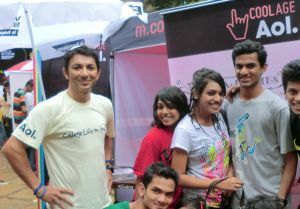 To attract the young crowd, we have adopted the global execution of AOL's Brand canvas on Coolage.in. You can use it to change the look and feel of the website. This was created by both global and Indian artists. Tell us about the Coolage team. We have a 7-8 member team that goes around India meeting colleges and doing a lot of groundwork. We must have our feet on street at every college. What are your plans for the website? Coolage.in will be the mother ship for AOL in India. We are currently present on Vodafone Live, Airtel Live, and a lot of other carriers are also interested in it. Advertisers are also very keen. We are at the cusp of a tremendous opportunity. I expect that Coolage will reach millions of college-going audience by next year, which will be more meaningful to advertisers and brands. Music and fashion are two pillars that we will build further. Our SMS voting for the Battle of Bands, where students picked the best band, was a success. Now we are planning to do something spectacularly different for new events with our short code 51516. And how are you generating revenues? A significant chunk comes from advertisements. We also have partnerships with brands for premium campaigns on the website â€“ like Nike's Bleed Blue campaign. Then we have distribution deals with national operators like Airtel, Reliance and Vodafone for subscription packages for the most popular and most commented sections on Coolage.in. We generate revenues from SMS short codes with this content. Carriers also promote subscription packages where one can subscribe to SMS alerts when their favourite student author writes a new post. So what's next for Coolage.in? Subscription alerts with real content is a huge business opportunity. Android and iPhone apps are also part of our roadmap. We wanted to launch the mobile site first and the Android app will arrive by the end of the year. On the marketing front, we are investing in creative and online advertising across Facebook, Indiatimes and Sify, as well as on the mobile. But we are not doing any print ads. Right now, Coolage.in is totally focused on India but in 2012, we will scale up and take the learnings from India to launch it in more APAC countries. Finally, how is AOL faring nowadays? Things are now fine at AOL. Stocks have gone up 12 per cent. We had a good earnings call and I believe, we are coming out of a bad phase. However, 2012 and 2013 will be crucial, when we start generating revenues at AOL India. We don't really want to count our chickens before they hatch, but Coolage is a game-changer. The team is very excited, it pushes the envelope every day and we see high energy levels in employees. It is definitely the dawn of a new era.